I’m not a sports player, but I am a great spectator. My clumsiness never stopped me from trying to be a good baseball player, dancer, rower, and my short stint in Flag Corps, but I was never a star athlete. I became an enthusiastic class clown in gym class by high school, as a show of using humor to deflect my lack of talent at sports, and my gym coach adored me for it. Do 100 squat thrusts? Bring it on! Try climbing the rope? I was there! My classmates got a kick out of my lack of athleticism and my fondness of making light of it with my natural ability to make people laugh and have fun. It was the first time in my life that I thought I was ‘funny’. Strangely, it gave me a lot of confidence and the more that I tried, the more I looked forward to going to gym. I forgot about the rowing captain telling me I was too small and weak to row, I forgot that I couldn’t catch a baseball to save my life, and I was finally able to accept that my want of perfectionism made me a rigid but disciplined dancer didn’t bode well in performances. I was killing it on the scooters and in flag football. I was part of a team during gym and people liked me whether or not I scored any points because I made the time fun – and I TRIED. My girls are a little too young to join sports teams at school just yet, but next year my oldest can try out for soccer, cheerleading, and a variety of random sports in elementary school and if that’s what she wants to do; I’m all for it. I will be a great spectator who cheers her on in the sidelines regardless of her athletic abilities as long as she enjoys herself and gives her best effort. Too much emphasis is placed on winning and you don’t need a trophy for playing a sport. It’s a lesson in having fun, energy, and enthusiasm to commit to your health and your ability to improve your performance. I never understood parents who screamed from the sidelines; it seemed to embarrass their children and they seemed to be such sore losers. Sure, you want your kids to do well and even win, but sportsmanship is extremely important. That’s why I loved reading with Brooke the new book called “Hey, Coach!” by Sterling Publishing. This sprightly rhyming picture book captures all the fun and energy of very young children having a blast on the soccer field. Over the course of their first season, the players progress from unsure newcomers to enthusiastic good sports who love the game—and even score! The humor and the real-kid voices will have readers rooting for this spirited and determined team. I hope both my kids are as lucky to find sports teams and coaches who share that common theme. GOAL! 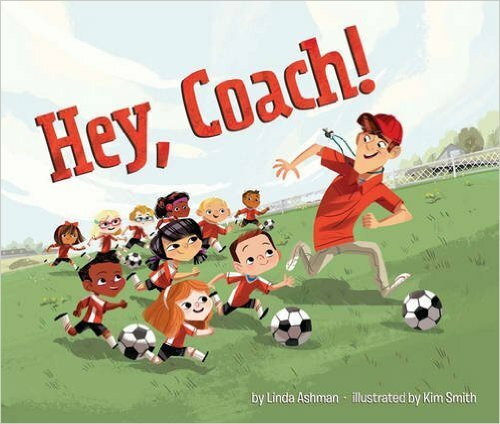 About the Author: Linda Ashman has cheered from the sidelines at many of her son’s soccer, basketball and—especially—baseball games, and has a great appreciation for the dedication and patience of coaches. Linda’s many picture books have been included on the “best of the year” lists of The New York Times, Parenting and Child magazines, the New York Public Library, and many others. In addition to more than 30 children’s books, including Sterling’s Over the River & Through the Wood and The Twelve Days of Christmas in Colorado, she is also the author of the self-published The Nuts & Bolts Guide to Writing Picture Books. She lives with her family in Chapel Hill, NC. Visit her online at lindaashman.com. About the Illustrator: Kim Smith has illustrated several books for children including Sterling’s Over the River & Through the Wood and The Twelve Days of Christmas in Canada. Kim lives in Canada with her husband, Eric, and their border terrier, Whisky, who is an aspiring soccer star. Visit Kim online at Kimillustration.com. ← Austin artist Bob Schneider’s children’s album I Will Find You No matter What : The songs of Luc and Bob Schneider for Amazon Music out 9/16!